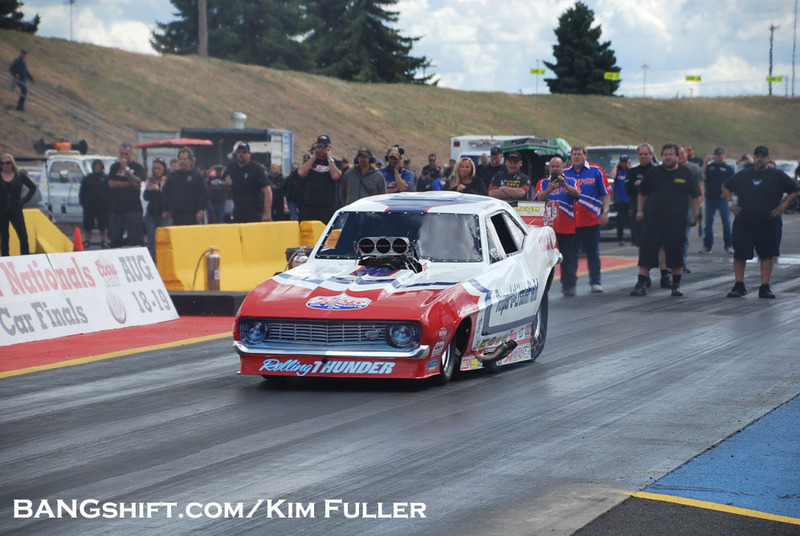 Danny Gerber’s Consistency Wins First Of Two UNFC Northwest Invitationals! 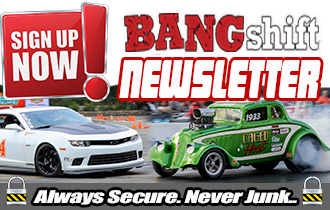 Jul 04, 2017Darr Hawthorne1320 Drag News, 1320 Event Coverage, BangShift 1320Comments Off on Danny Gerber’s Consistency Wins First Of Two UNFC Northwest Invitationals! 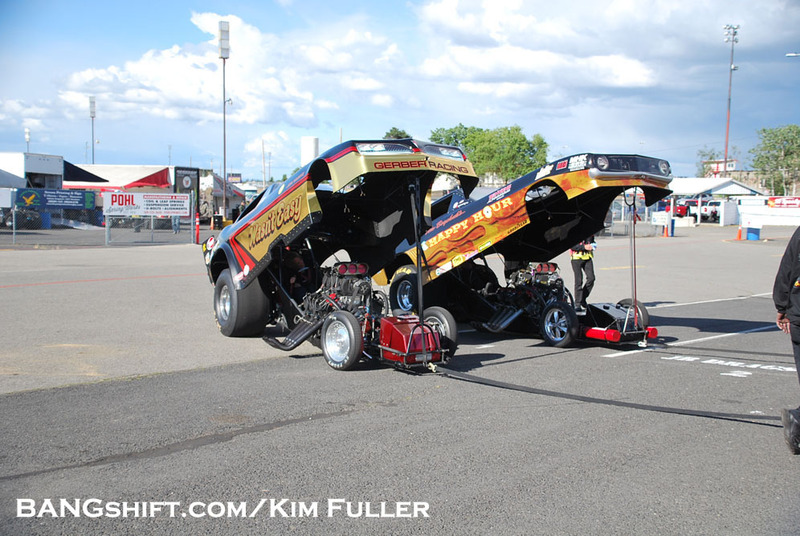 (Photos by Kim Fuller) This year, United Nitro Funny Cars has stepped-up the competition on the west coast by holding two Invitational drag races in the Pacific Northwest, one at Spokane County Raceway and a second on July 7 & 8 at Pacific Raceways in Kent, Washington. 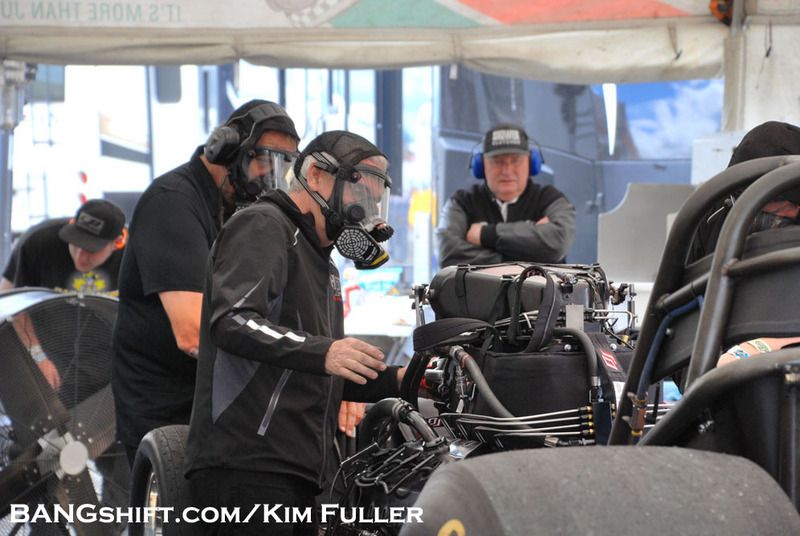 Legendary promoter Bill Doner heads the organization representing twenty NHRA Heritage-type nitro funny car owners. 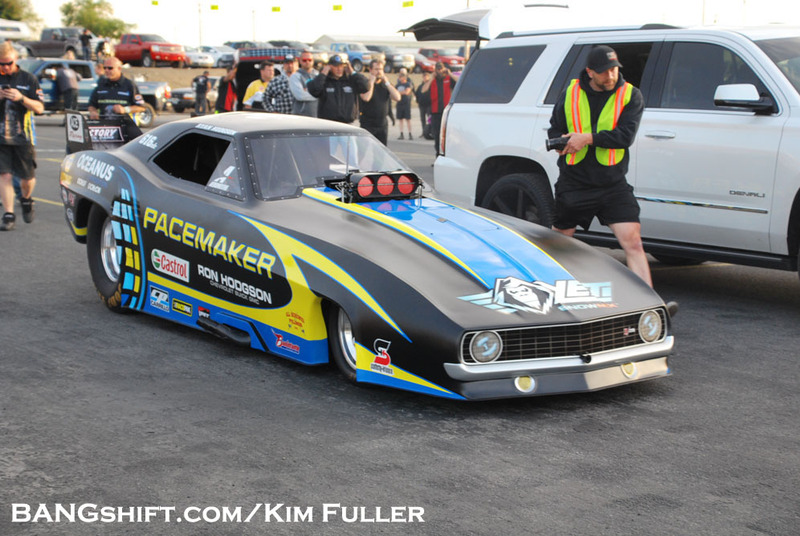 The first event brought eleven UNFC member racecars to Spokane, where, after three qualifying rounds on a cold slick track, netted 2015 Heritage Series Champion Steven Densham the number one position with a 5.76 elapsed time pass in the family’s “Teacher’s Pet” Camaro. 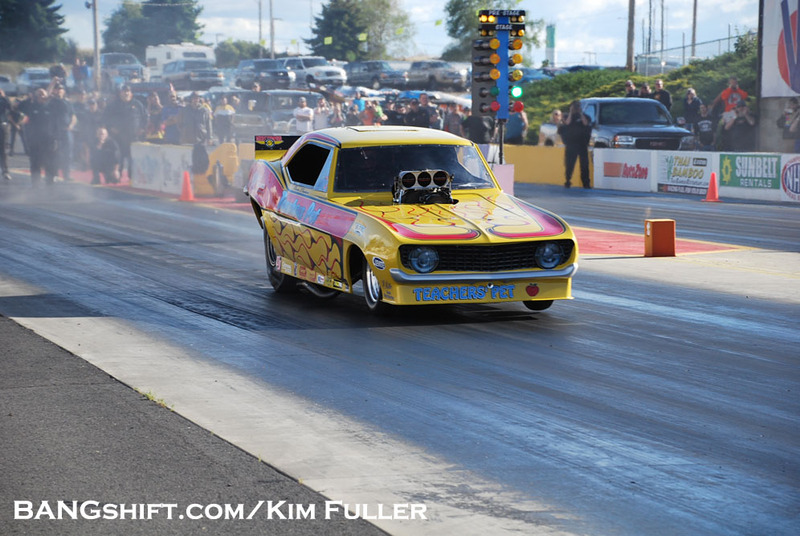 Oregonian Wally Giavia in his “G-Men” Dodge qualified second at 5.84, IHRA event winner Tim Boychuck’s “Happy Hour” Firebird third at 5.94, and the 2017 Good Vibrations March Meet winning “Pacemaker” Camaro of Canadian Ryan Hodgson fourth at 5.95. 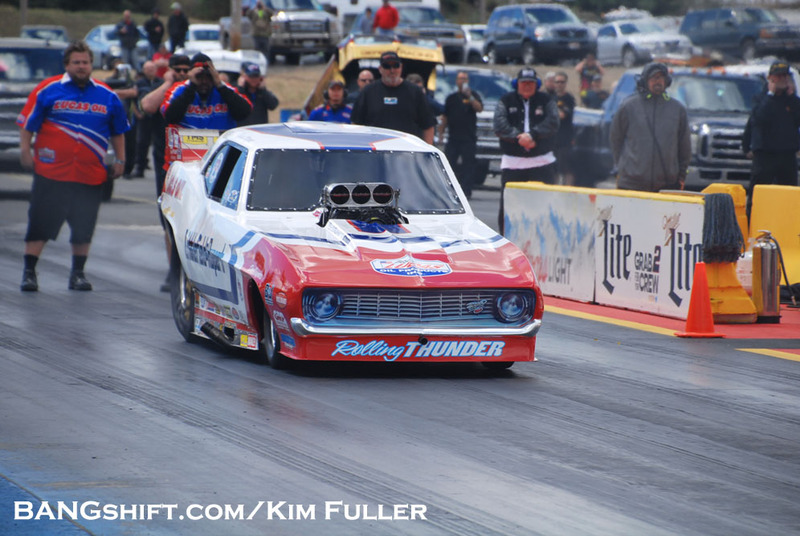 Multi-time IHRA and NHRA National Champion Jason Rupert in his “Rolling Thunder” Camaro (above) sat fifth with a 6.00 elapsed time, with Danny Gerber’s “Wasn’t Easy” Firebird sixth at 6.01 ET. 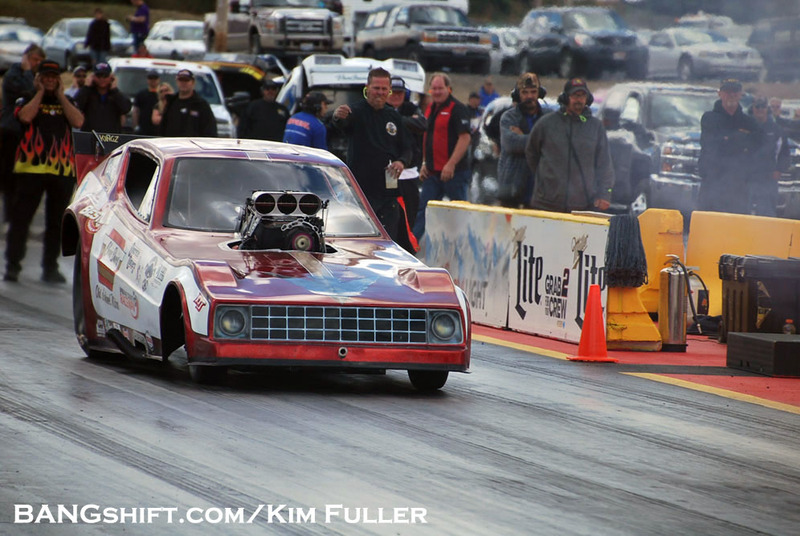 Chris Davis (above) landed seventh at 6.13 in his “Old School Nitro” Plymouth Arrow and at rounding out the field at 6.185 was Canadian Nathan Sitko’s Arrow. 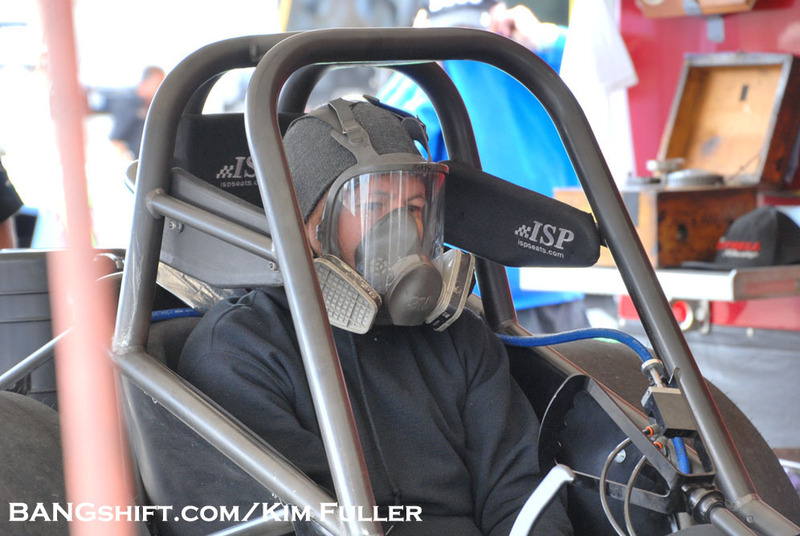 Geoff Monise in the “Quarter Pounder” Monza replaced Jason Rupert, who retired with engine damage, into eliminations from the first alternate position. 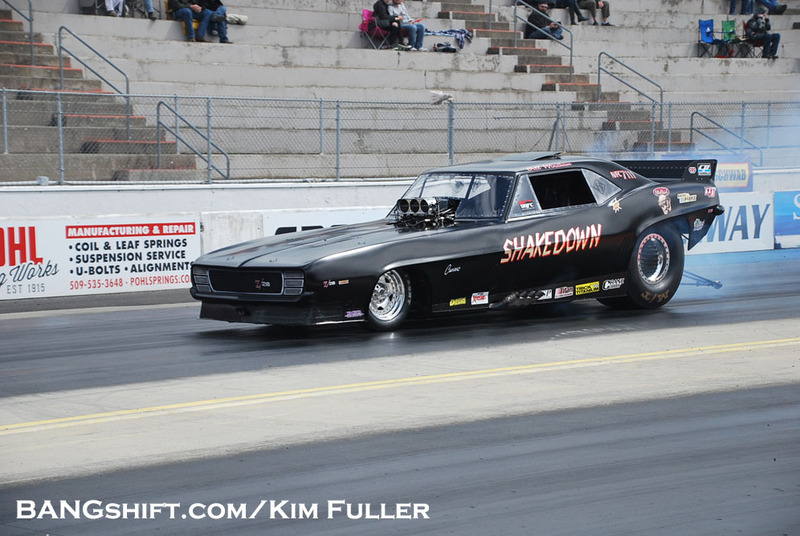 Newcomer Bobby Cottrell in the 2016 NHRA Championship winning Austin & O’Brien “Northwest Hitter” Camaro and Bill Windham in his “Shakedown” ’69 Camaro did not qualify (below). 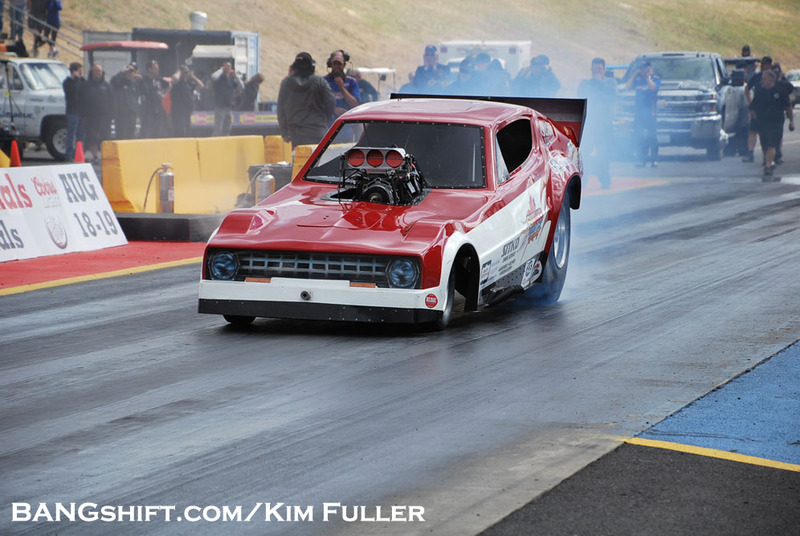 Danny Gerber (6.06) defeated Steven Densham (7.36) Densham tagged the guard wall after a starting line wheel stand. 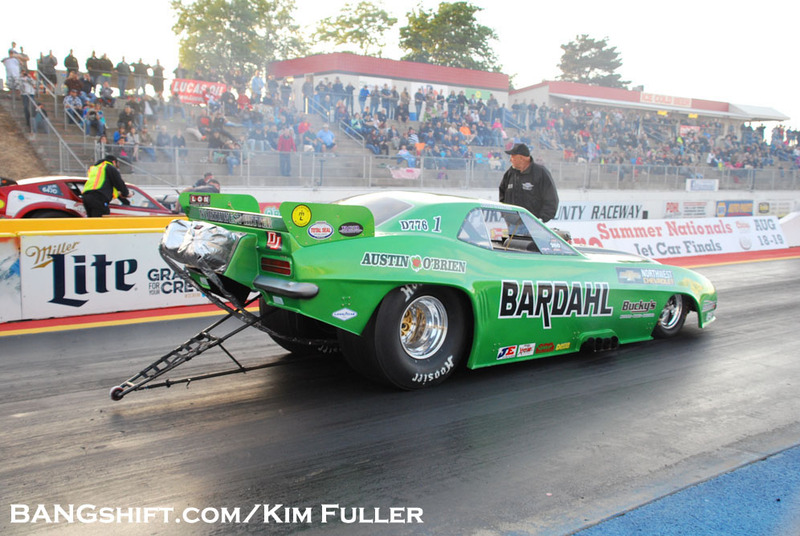 Danny Gerber’s consistency paid off with a 5.96, defeating Ryan Hodgson, who immediately darted to the right at the green light. 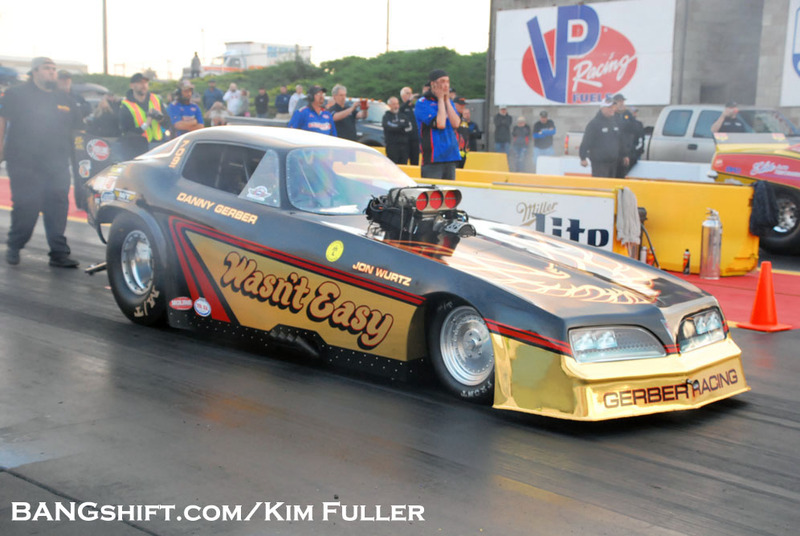 Gerber, in his Jon Wurtz tuned Firebird had never won an event or an elimination round in a nitro funny car, and along with his wife Crystal grabbed the $7,500 cash payout. 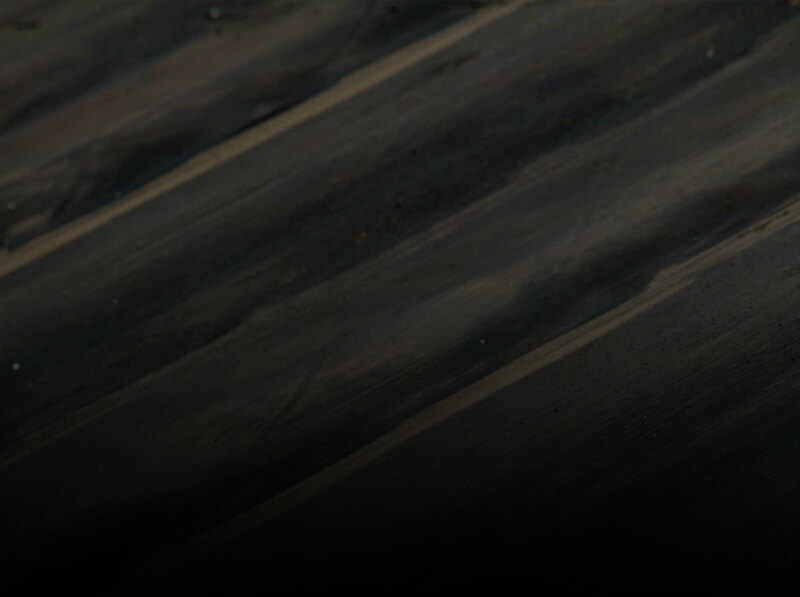 Runner-up Hodgson received $5,000 for his effort. 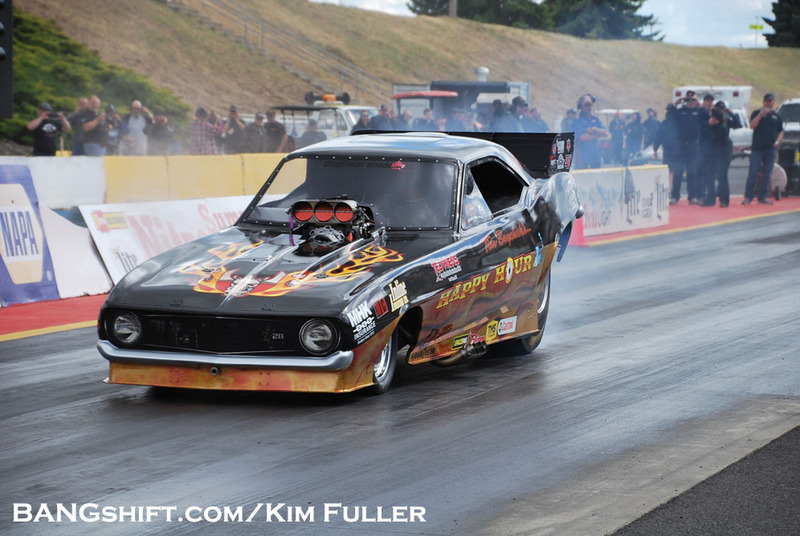 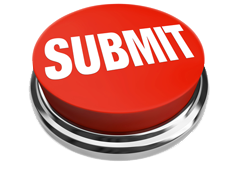 The second UNFC Invitational begins Friday night July 7th with qualifying under the lights at Pacific Raceways in Kent, Washington, final qualifying and eliminations start at noon on Saturday July 8. 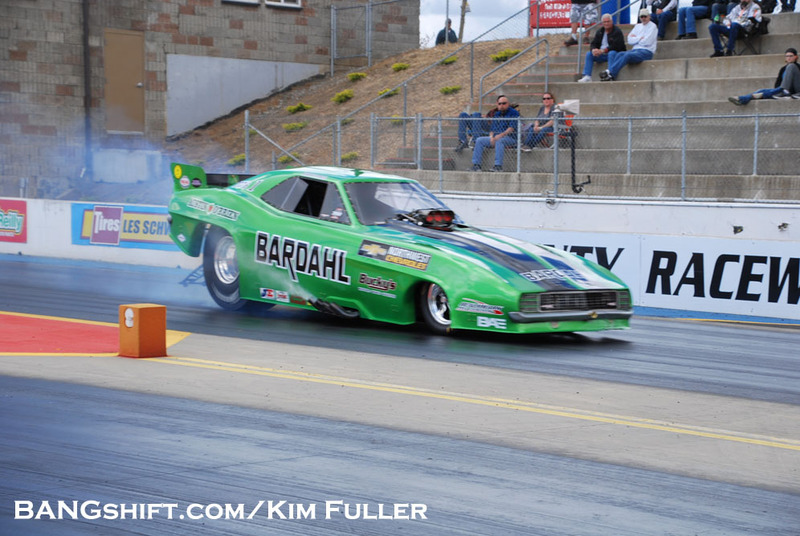 IHRA event winner Tim Boychuck’s “Happy Hour” Firebird qualified third at 5.94 elapsed time. 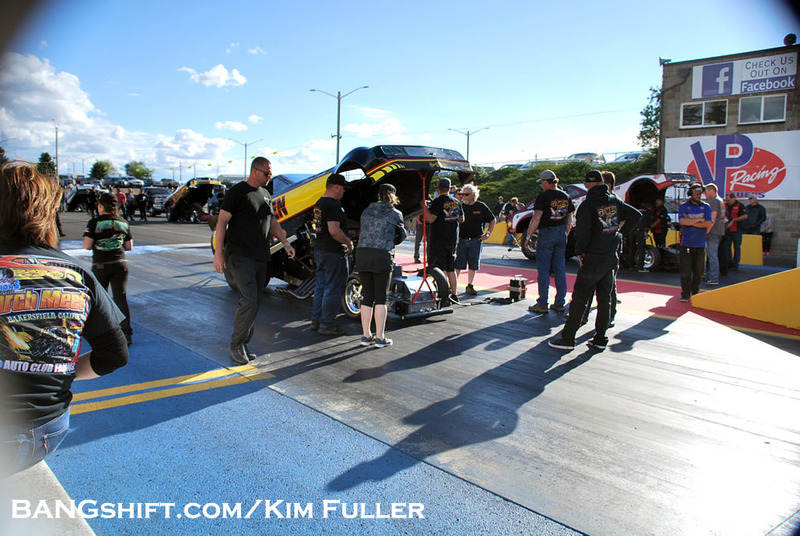 A good crowd of funny car fans were ready for nitro! 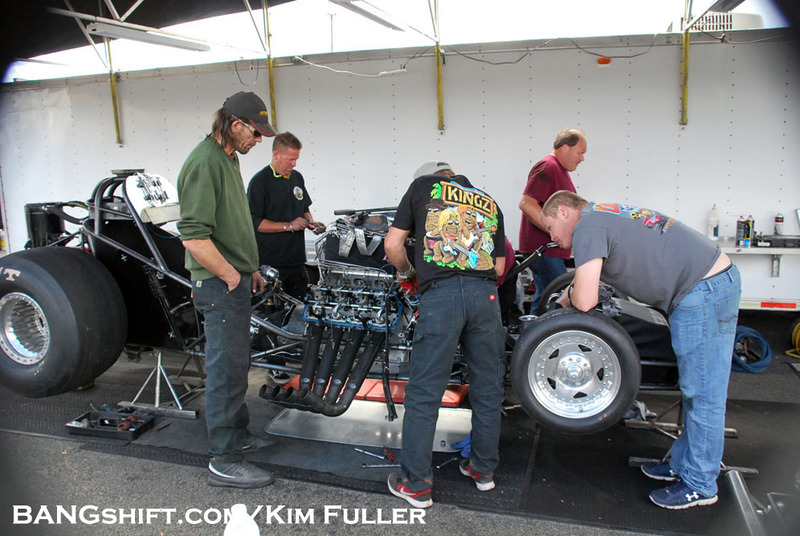 Crew Chief Bob Papirnick (above) tuned 2017 Good Vibrations March Meet winner Ryan Hodgson to a runner-up finish at Spokane County Raceway.